KEY CONCEPT: Multiplication word problems. 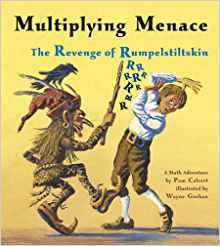 DESCRIPTION FROM THE PUBLISHER: Rumpelstiltskin is back! This time he’s making mischief with his multiplying stick. Can Peter unlock the secret of the stick in time to save the kingdom? Whimsical illustrations bring fun to multiplying whole numbers and fractions.